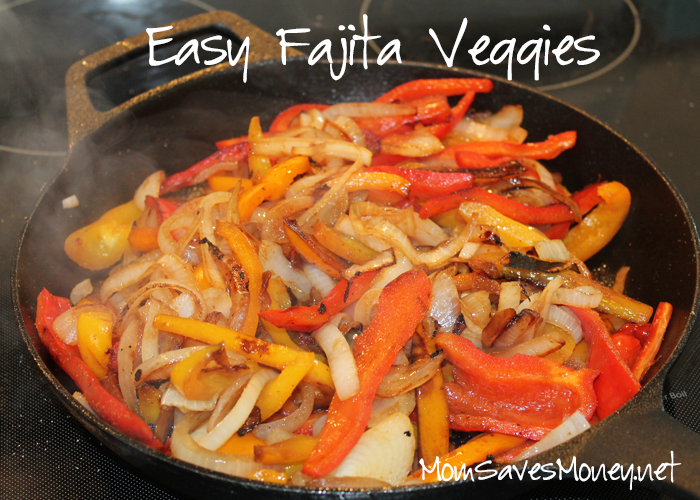 Recipe – Easy Fajita Veggies! Fajitas are one of my favorite meals. If I get a choice of restaurant, it’s quite common for me to choose Mexican. I always think of fajitas as too difficult to make at home, but really, it’s not. I’ll make chicken taco meat and have chicken tacos one night, then follow it up with chicken fajitas the next night. It particularly works well if I make enough Mexican-inspired sides to last for 2 nights. My cheesy bean dip is perfect for that! I’ve found that the key, for me, to making fajita veggies is the marinade. I’ve played around with different fajita marinades and have found some really good ones. But I’ve also found that I enjoy a super simple one just as much as the complicated ones. So, if I can keep things simple, but still really tasty, I’ll do it! I make these veggies in my cast-iron skillet, which works wonderful! But you can also make these in a big pan or even on a griddle. The griddle is great if you’re making it for a bigger size group too. You can make as many or little as you want. For a family of 4, I’d probably use at least 1 onion and 3 peppers. My family loves red bell peppers in particular! Place just a little bit of oil or butter into your pan or griddle. Heat the pan/griddle to medium heat. Add in your peppers and onions. They don’t have to be in a single layer – it’ll all work out. Sprinkle with a little sugar. Not too much, but it helps the veggies to caramelize. Put in some dashes of worcestershire sauce. Better to go too little than too much as you can always add more later. Let them cook. Stir every few minutes to evenly heat. They’re done when they’re as crisp or soft as you’d like. Jayme is a wife to 1 and, so far, a mother to three little boys. She coupons, but isn’t super extreme about it. She price matches and loves it! While she likes to cook, she’s in the stage of life where simple is usually better! She never knows how many hands she’ll have free at dinner time! You can find her at No Regrets Living. Anyway recipe that can be called “easy” is my kind of recipe! Thinking to plan for a Fajita Friday this week! Thanks for the idea. Yum! Your recipe for fajita veggies is a bit different than mine. I’ll have to try yours and see which I like better 😉 Thanks for sharing on the Sunshine Life Link Up!